The appearance of your driveway and patio is the key to presenting your home and garden at its best, for all to enjoy and appreciate. We also understand that, over time, these important areas of the garden and living space need some care and attention due to the build-up of dirt, algae and weeds. At Falcon Maintenance we are able to provide a state of the art pressure washing system that will transform your patio or driveway. How do we transform patios and driveways? We clean the surface of each paving stone or slab and clear weeds from between the joints. This work is the preparation that is needed prior to brushing in kiln dried sand and then sealing the surface with our specialist sealant solution that enhances the appearance and helps to suppress the regrowth of weeds. 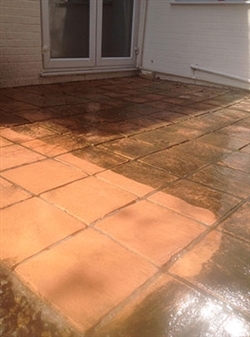 Falcon Maintenance take pride in offering a high quality pressure washing service that uses specialist-cleaning equipment that will transform your driveway, patio and walls to their original state and at a competitive price for both domestic and commercial property owners. All Falcon Maintenance staff are fully trained in the latest high-pressure surface cleaning equipment, processes and systems to ensure your satisfaction is guaranteed. My wife and I were exceptionally pleased with the work carried out by the Falcon Maintenance technician on our front and rear paving. A thorough job done by a friendly and helpful person and left the property in a clean condition (windows were cleaned as a result of water spray which was unavoidable.